Images provided are from an 11 year old crossbred canine with a history of non-weight bearing forelimb lameness progressing to paralysis with no withdrawal and marked muscle atrophy. On examination marked muscle atrophy surrounding the scapula (infraspinatus and supraspinatus muscles) was noted. On reflection of the limb two firm masses and several small nodules were associated with the vessels and nerves of the brachial plexus. Thickenings within the nerves extended a short distance into thoracic soft tissue. The masses surrounded the axillary artery, and, contained within the epineurium, spindle shaped cells infiltrated or effaced normal peripheral nerve architecture (C6-T1 nerve roots). 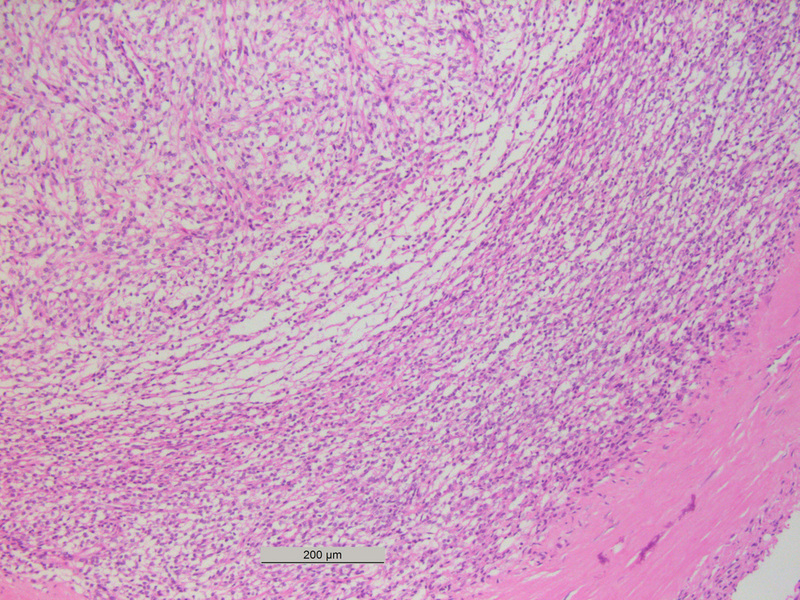 Fascicles of variably dense spindle cells were arranged in wavy bundles. 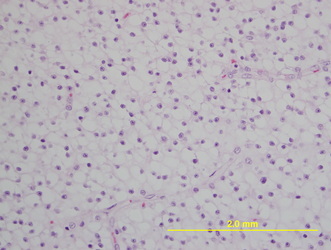 The cells had elongate, normochromatic nuclei and trailing, indistinct eosinophilic cytoplasm. 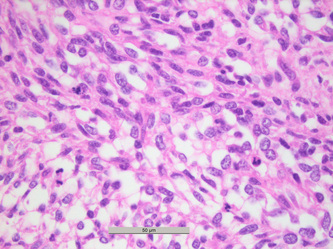 Thin bands of collagen often separated individual neoplastic cells. In one focus there was cartilaginous differentiation, with pale matrix surrounding rounded nuclei in lacunar-like spaces, and there was a focal cluster of multinucleated cells adjacent to this area. 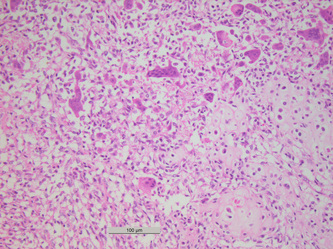 The mitotic rate was moderate in some areas (2 per 40 x field), and there were foci of necrosis. Diagnosis: Malignant peripheral nerve sheath tumor. 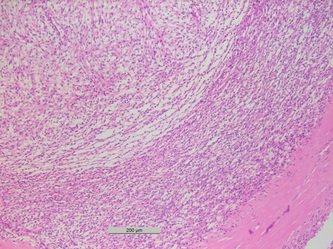 Differentiation within the tumor included formation of cartilage. 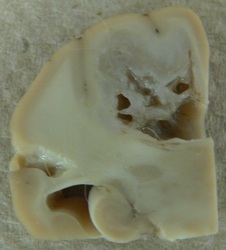 Cartilaginous metaplasia is an uncommon feature described in canine schwannoma. 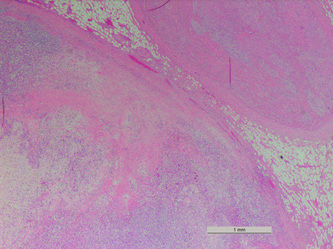 The following images are from a young adult, spayed female English Bull Terrier canine that exhibited vomiting and diarrhea for approximately 1 week, then developed hemorrhagic diarrhea, decreased appetite and lethargy. 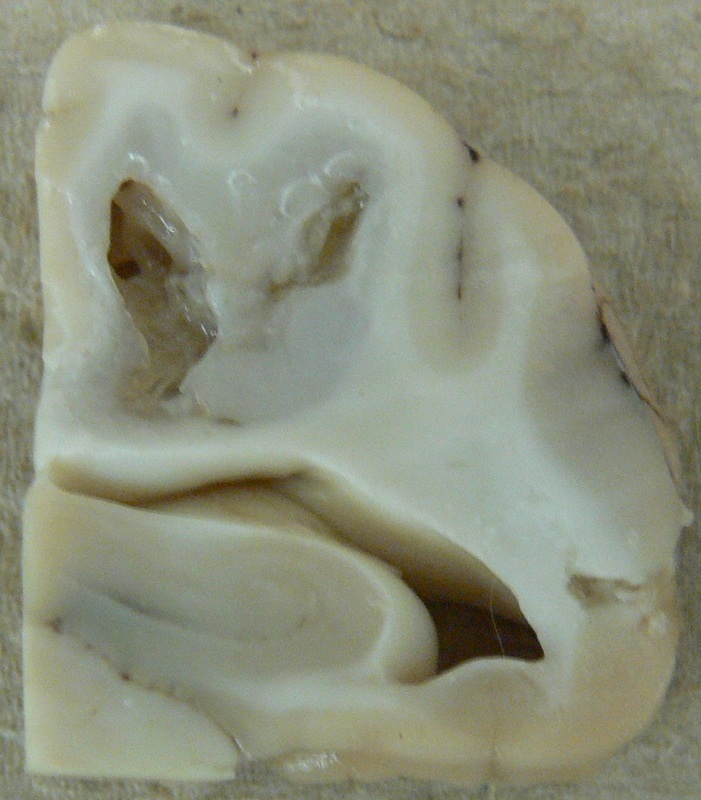 On gross examination the dog was found to have ulcerative lesions on the paw pads of all feet, focal ulceration of the gingiva, multifocal hemorrhagic suture reactions with associated adhesions at sites of previous ovariohysterectomy, and a 4.0 X 3.5 cm left adrenal medullary mass that was pale and rubbery on cut section. 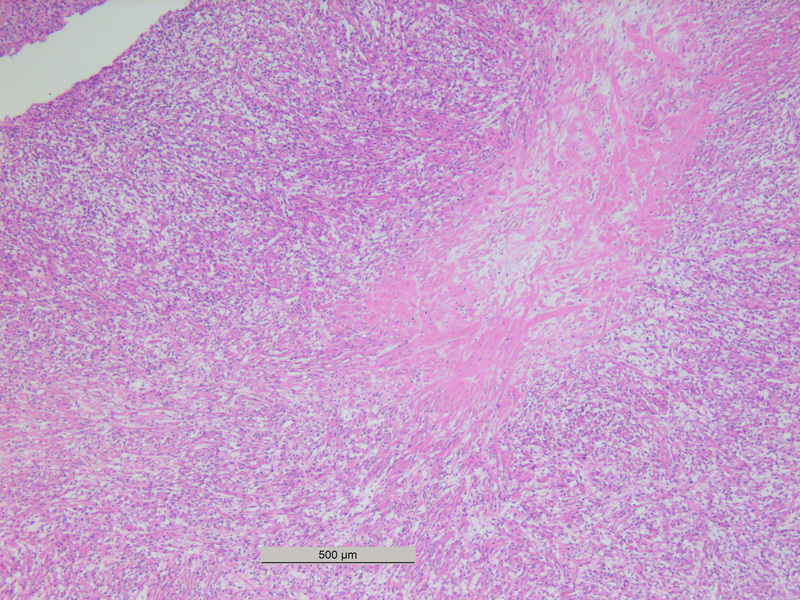 A thin line of compressed cortical tissue was present in some areas and all other adrenal tissue was effaced. On histologic section, a small portion of the cortical zona glomerulosa was identifiable, and the tissue otherwise consisted of a lobular mass of bundled peripheral nerve fibers, separated by indistinct vascular stroma, that included scattered individual or clustered nerve cell bodies. Cell bodies randomly appeared degenerate or necrotic, having peripheral vacuolation, hypereosinophilia, karyorhexis and karyolysis. Diagnosis: Left adrenal gland: Ganglioneuroma. Ganglioneuromas are considered rare tumors in all species and arise from sympathetic ganglia, thus they are composed of large nerve cell bodies, Schwann cells and nerve fibers. They are benign tumors, but hormonally active forms have been reported. If active, secretion of catecholamines, vasoactive intestinal peptides, or androgenic hormones could result in a wide variety of symptoms such as hypertension, diarrhea, and masculinization. In humans and cattle these tumors may be part of the condition neurofibromatosis. The following images are from 9 year old DLH feline that presented as a transfer for supportive care following known ingestion of a floor cleaner that contained petroleum naptha. The cat was reported to have exhibited altered behavior, was dazed, and ataxic about 2 days after exposure. Blood work was normal. The cat became stuporous and recumbent with positional nystagmus, then developed hindlimb flexion, mild opisthotonus, rigid forelimb extension and died. 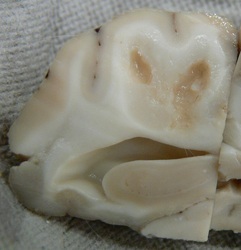 On gross examination of coronal sections of the frontal and parietal lobes of the brain a large cavitated mass was found extending from the left lateral ventricle to the grey-white junction of the cortex, effacing white matter neuropil, and white matter tracts adjacent to the cavitated portions of the mass were markedly expanded. The mass was composed of a monotonous population of round cells with a moderate amount of pale to clear cytoplasm with fine, pale, fibrillar material visible on the margins of some cells. Nuclei were round and either central or peripheralized. 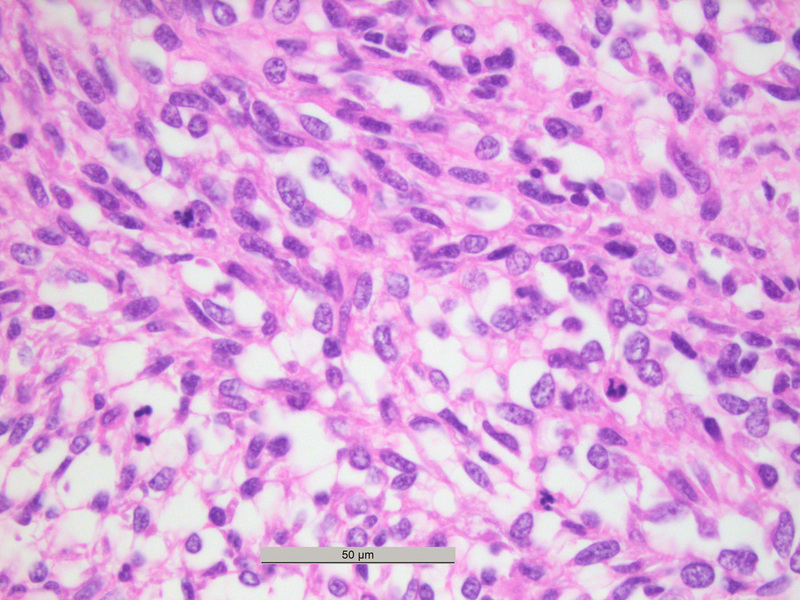 There was mild variation in nuclear size and no mitoses were identified. On the margins of the mass a moderate reactive astrocytosis was noted, a band of neovascularization was present at the junction of the mass with the ependyma of the ventricle, and sheets of neoplastic cells were also present within the choroid plexus. A 2 Yr old female hybrid chicken presented with ataxia, mouth breathing, and a pale comb. The ataxia had a gradual progression to inability to stand. A strange soft tissue lump was also noted next to vent. The chicken was euthanized due to poor prognosis. On postmortem examination the sciatic nerves were irregularly enlarged. 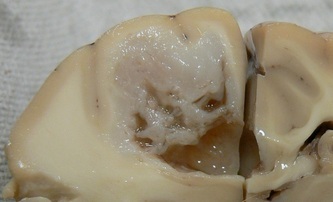 The mass was found to have a necrotic center on cut section and was composed of pale, soft, bulging tissue that extended into the muscles of the left leg. 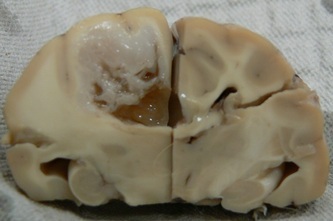 Diagnoses for this bird included bilateral sciatic plexi and nerves: Lymphoblastic lymphoma and lymphoplasmacytic neuritis; Brain: leukocytic vasculitis and encephalitis with vasogenic edema; soft tissue of the proximal left caudal limb: Lymphoblastic lymphoma with extensive central necrosis. Gross lesions are common in the sciatic nerves of birds with MD, but may be found in other peripheral nerves, spinal roots and spinal root ganglia, and the celiac plexus is also common. Central nervous system lesions are not as common but have been reported in the past and were in fact extensive in this case, running the length of the brainstem, extending into the cerebellar white matter, and present at the optic chiasm. In perivascular locations the lesions tended to be inflammatory, lymphoplasmacytic. 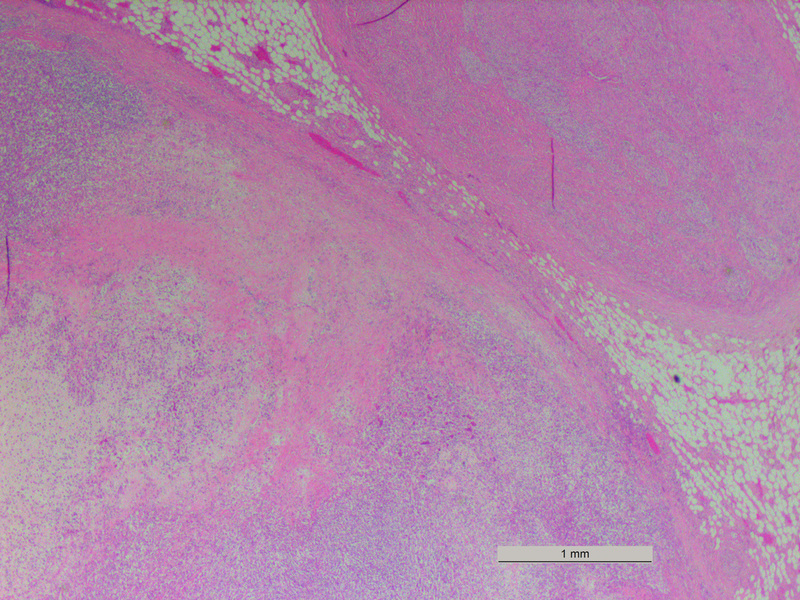 Lymphomatous tumors can be found in virtually any tissue, and in this case the mass adjacent to the cloaca may have originated from a peripheral nerve, the bursa, or other regional soft tissue. Marek’s disease (MD), spread via a respiratory route, is caused by a cell-associated Herpes virus with properties of alpha and gamma groups. Cytolytic phases of the infection are followed by latent periods in which lymphoid cells can be infected for the lifetime of the bird. Complete virus replication can take place in feather follicle epithelium, lymphoproliferation is the hallmark of the disease, and this can culminate in lymphoid tumors in numerous tissues throughout the body. There is an effective vaccine that will prevent infection, there is no effective treatment, and in very rare cases lesions can spontaneously regress. Key differentials for MD that in some instances cannot be ruled out are Lymphoid leukosis (LL) and reticuloendotheliosis (RE), caused by retroviruses. A 7 year old female spayed Husky canine presented with a clinical history that included lameness, followed 13 days later by inappropriate elimination and loss of vision, followed 16 days later by aggression. Examination 3 days later identified optic neuritis, at which time the dog was euthanized and submitted for postmortem examination. 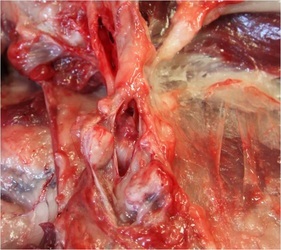 Cranial cervical spinal cord: There is moderate vacuolation of the ventral white mater tracts. Meninges: Gross: The dura is congested and hemorrhagic, and the cortical hemispheres are bulging with the right hemisphere more greatly expanded than the left. Removal of the dura reveals a smooth mass within the longitudinal fissure, slightly to the right of midline that is upwardly bulging and compressive. The mass fills the dilated right and most of the left lateral ventricle. Histopathology: The dura is expanded with collagen and contains blood vessels cuffed by lymphocytes and plasma cells and lined by reactive endothelia. 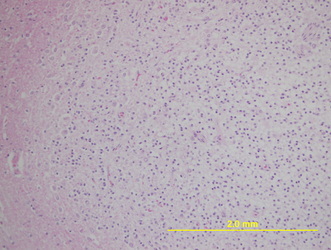 The intraventricular mass is densely cellular and composed of sheets and whorled spindle cells, and clusters of round cells. The spindle cell population has oval nuclei with finely stippled chromatin and trailing eosinophilic cytoplasm, and cells are separated by variable amounts of brightly eosinophilic collagen. 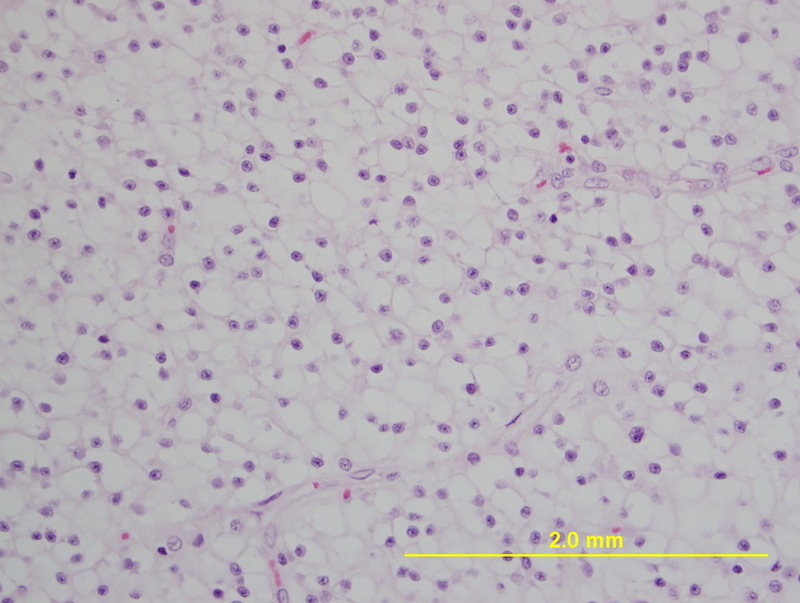 The round cells superimposed on the described are clustered and consist predominantly of lymphocytes and plasma cells, with occasional Mott cells admixed. 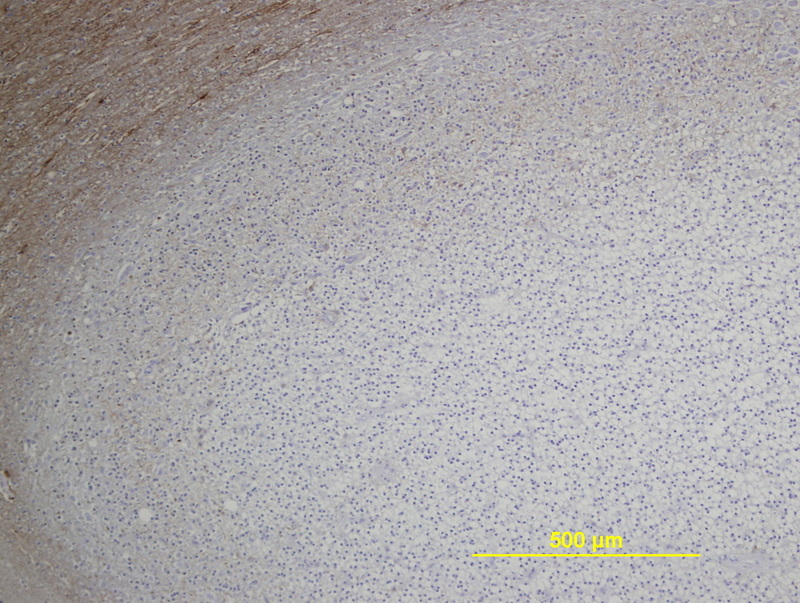 The lymphoid cells are denser in the periphery of the mass. 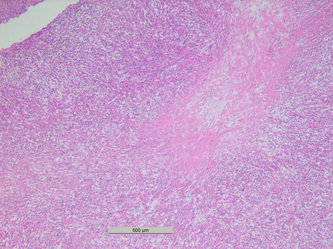 Brain; intraventricular mass: Lymphoplasmacytic meningioma with secondary hydrocephalus. Brainstem/cervical spinal cord: Ventral column white mater edema. 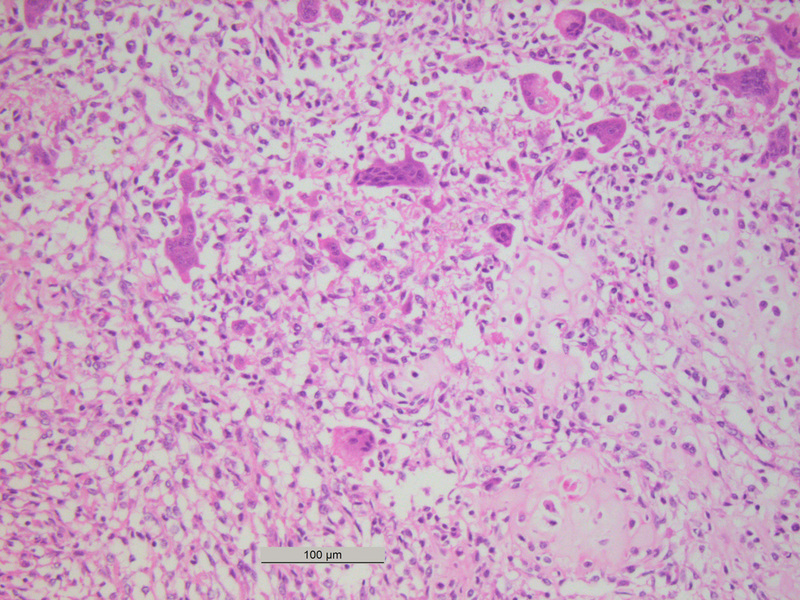 Meningiomas have a wide variety of histologic patterns, often demonstrating multiple patterns within the same tumor. 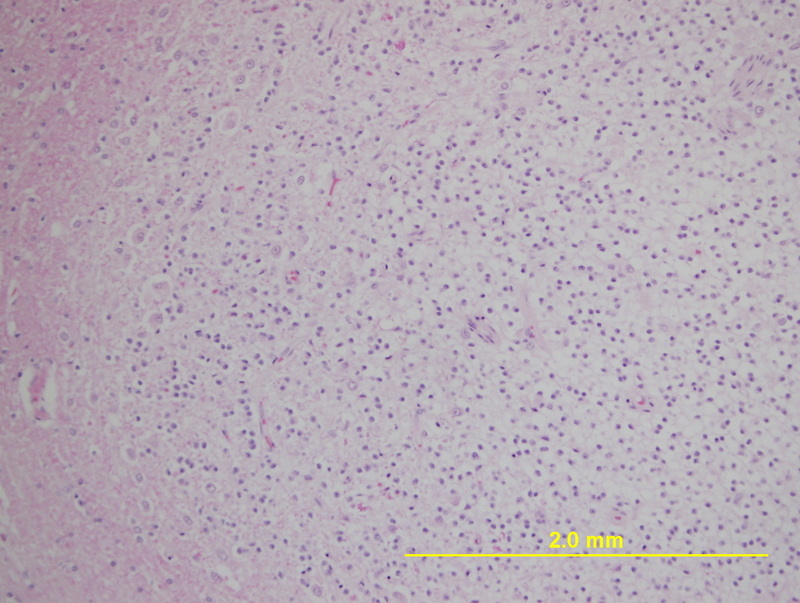 The meningioma in this dog had a prominent inflammatory component, which bore closest resemblance to the human subtype described as lymphoplasmacyte-rich meningioma. 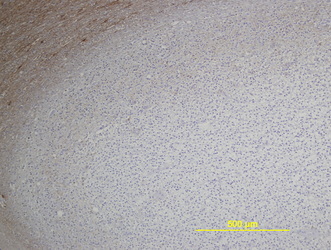 In the case of this tumor, however, neoplastic cells did not have an epithelioid appearance, rather, they were elongate and had a “fibrous” arrangement. Infiltration into the parenchyma of the brain was not identified and the neurologic signs described are presumed to have been due to the space-occupying and compressive effects of the mass and secondary hydrocephalus.